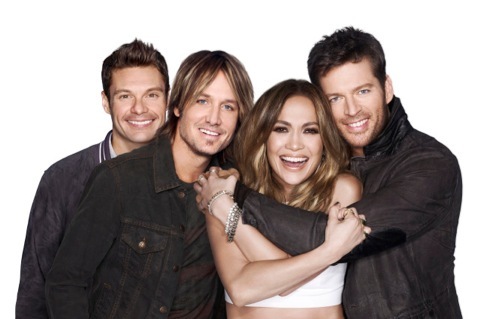 Fox’s American Idol won’t change any horses next season despite record low ratings for its Season 13 finale and its weakest overall season performance since the summer 2002 launch. The network announced Monday night that judges Jennifer Lopez, Keith Urban and Harry Connick Jr. will all return, along with charter host Ryan Seacrest. Fox’s publicity release made no mention of the show’s continued ratings slide, which now has it running well behind NBC’s The Voice among prime-time singing competitions. Fox also announced that Season 14 of Idol, due in January, will inaugurate a “True Believers” gimmick in which each contestant names a single person as their most fervent backer. The “True Believer” behind the eventual winner will receive a $50,000 cash prize. The May 21st Season 13 finale of Idol drew 10.53 million viewers, smallest in the show’s history. The previous year’s season finale had 14.31 viewers, marking the first time Idol had dipped below the 20 million mark for its climactic announcement of the show’s winner. For the entire Season 13, Idol averaged 11.94 million viewers for its performance shows and 11.43 million for its results editions. The sixth edition of The Voice averaged 14.57 million viewers for the entire season. Its season finale audience of 11.69 million viewers on May 20th wasn’t that much bigger than Idol’s, though. And The Voice likewise has been losing viewers. ***AMC has renewed its Revolutionary War drama Turn for a second season of 10 episodes. The series, which received mixed reviews, averaged just 2 million viewers for episodes and repeats shown across a full week. But AMC’s publicity release cited its “passionate core audience” and the potential to build on it. “AMC and its creative partners have a track record of nurturing programs we collectively believe in, patiently growing viewership and engagement over time,” said AMC president Charlie Collier. On another AMC front, the network is all in and then some with its Breaking Bad prequel, Better Call Saul. Although a 10-episode Season 1 won’t premiere until early next year, the network already has ordered a 13-episode Season 2 (which is scheduled to launch in early 2016). The series stars Bob Odenkirk reprising his super shady attorney character, Saul Goodman. Odenkirk is coming off a much-praised performance in Season 1 of FX’s Fargo as sheriff department chief Bill Oswalt.